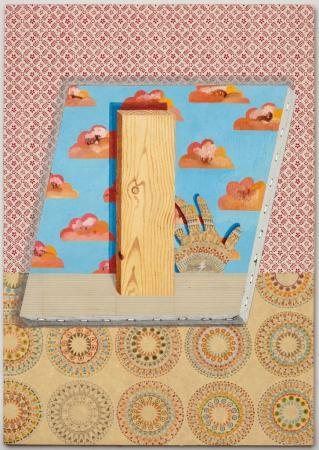 Outsider artist Timothy Wehrle's featured work is autobiographical. The viewer learns much about his background, hopes, dreams, and frustrations based on the imagery cleverly portrayed in his paintings. He manages to fuse an aura of charm with an undercurrent of reproach. Wehrle avoided formal artistic training, believing that it would suppress a pure vision. 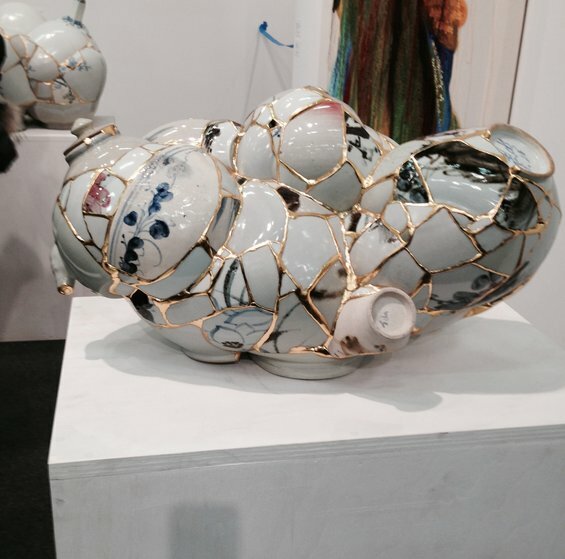 Ceramic sculptures by Yeesookyung were on view as part of her Translated Vases series. She pieces together shards of fine china having been discarded due to flaws in the eyes of the master potters. She gives them new life by reassembling them with epoxy and 24k gold leaf, yielding sculptural montages freed from historical references but rich in contemporary abstraction. Born in 1963 in Korea, Yeesookyung studied at the College of Fine Arts in Seoul and has completed residencies at Villa Arson, Apex Art and the Bronx Museum. Her work has been shown globally. Johannes VanDerBeek's mixed media landscapes, made of aqua-resin, fiberglass, steel, clay, paint and silicone, play with how materiality can be used to create objects and images that range in style. In a series of cast wall works, the picture plane is filled to varying densities to create dimensionality, depth and color. Bridging printmaking, painting, sculpture and drawing, VanDerBeek uses materials as a way to create unexpected visual clues. As the viewer examines the works, processes slowly reveal themselves and objects unfold in different directions. These objects require looking, and provoke questions about how physicality can emulate shifting mental states. 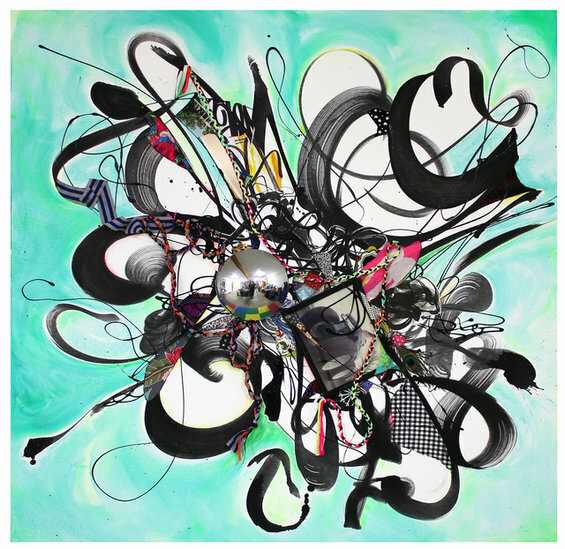 American artist Shinique Smith's collage work was striking...she uses acylic, ink, fabric, ribbon and a hubcap in this piece. Smith is inspired by the vast vocabulary of things that we consume and discard. Examining the ways in which such objects can resonate on a personal and social scale, she pursues the graceful and spiritual qualities in the written word and the everyday. Shinique Smith was born in 1971 in Baltimore, MD. She earned both her BFA and MFA from the Maryland Institute College of Art and her MAT from Tufts University and The School of the Museum of Fine Arts, Boston. 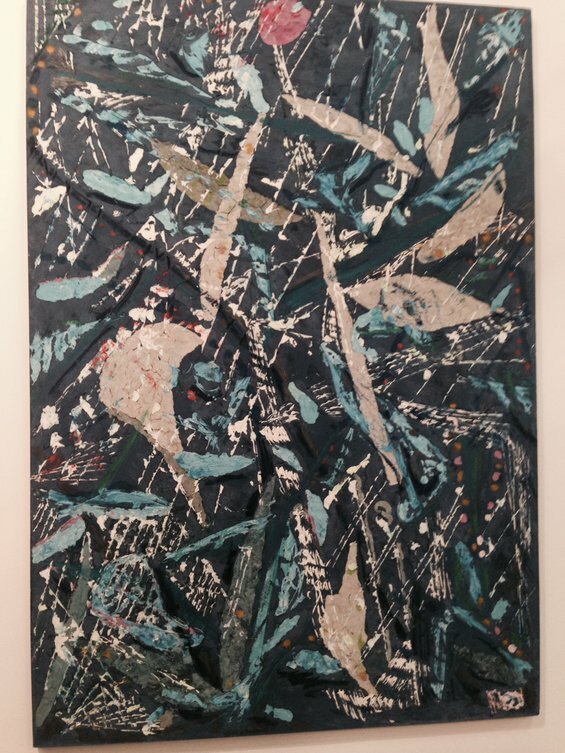 Smith’s work is included in several prestigious permanent collections, including the Brooklyn Museum, NY; Denver Art Museum, CO; Los Angeles County Museum of Art, CA; Margulies Collection Miami; Maryland Institute College of Art, Baltimore; Rubell Family Collection, Miami; Studio Museum in Harlem, New York; and the Whitney Museum of American Art, New York. 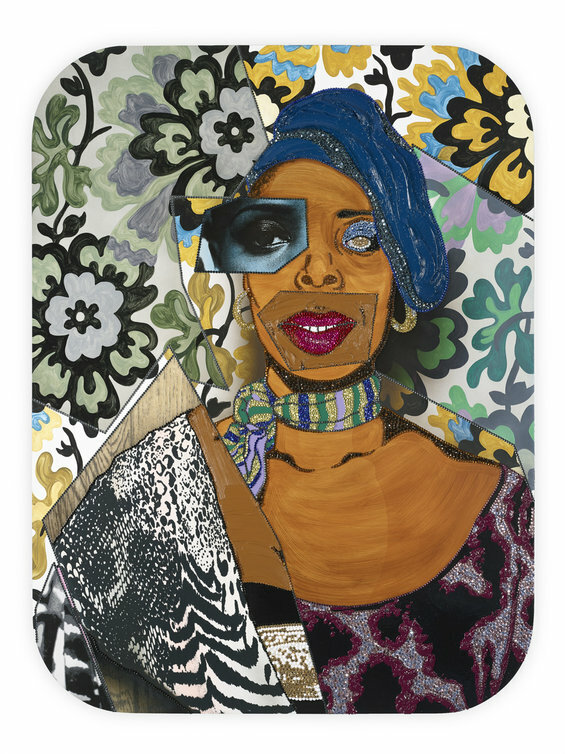 Celebrating women as usual was Mickalene Thomas with beautiful examples of her work with rhinestones, oil, acrylic and silkscreen on wood panel. Thomas introduces a complex vision of what it means to be a women and expands common definitions of beauty. 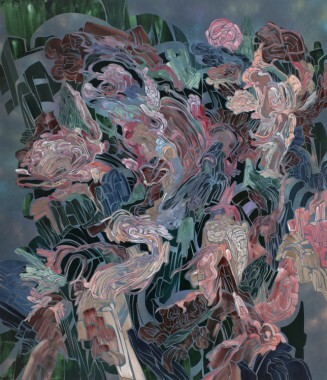 Her work stems from her long study of art history and the classical genres of portraiture, landscape and still life.